Pen and ink and wash drawing of the pillar in front of the Chandranatha Jain temple at Mudabidri, dated c.1815. 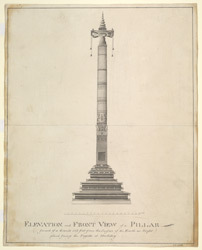 Inscribed: 'Elevation and Front View of a Pillar (formed of a Granite 521/2 feet from the surface of the Earth in Height) placed facing the Pagoda at Morbidry'. The town of Mudabidri in Karnataka has around twenty Jain temples (bastis) with sloping roofs typical of the coastal style of architecture. The Chandranatha Basti dates from 1429 and later and is situated in the principal street of the town. This drawing depicts the monolithic column, circa 16.5 metres high, which stands in front of the temple. The double capital is adorned with animals and figures and is capped by a pot finial. The temple consists of a sanctuary preceded by three columned mandapas or halls, surrounded by a colonnade. These have sloping wooden roofs in tiers and heavily overhanging eaves. A fourth mandapa dedicated to Bhairavadevi is a free-standing structure.